Lute songs of the English renaissance, — from the time of Shakespeare and Queen Elizabeth I.
Friday 20 November 2015 19:30 — Concert hall, Jan Deyl Conservatory, Maltézské náměstí 14, 118 00 Praha 1 (Malá strana), Czech Republic. At this darkening time of year, many people feel an autumnal melancholy coming over them. In Shakespeare’s time, this ‘humour’ was considered to be an appropriate state of mind for artistic endeavours and philosophic reflections, as it encouraged looking within to find truths that were not part of our active everyday lives. John Dowland is often considered the master of melancholy, perhaps the “Leonard Cohen” of his time. All of us working in this repertoire are happy to acknowledge that “the best songs are the sad ones”, yet we usually feel we need to use these gems sparingly, lest our modern audiences tire too easily or feel uncomfortable with the deep feelings expressed in these ayres. We are going to go straight to the heart of this repertoire, and beguile you with some of the greatest jewels in the English song-writing tradition. Dowland influenced many of his contemporaries, including John Danyel, Thomas Campion and Robert Johnson (who played the lute in Shakespeare’s theatre troupe and composed songs for his plays), and we will hear offerings from each of them that explore the melancholy humour in ways to do with love, loss, grief and religious yearning. We hope this offering will leave you feeling quietly uplifted, and reminded that the consolation of Philosophy is that there is always hope, even in the darkest night. Evelyn Tubb has had a long love affair with music, whose several strands weave together to make a most stimulating life, with new horizons always beckoning. Performing is her first love, and manifests in various forms. Evelyn has devoted many years to vocal ensemble work, with the Consort of Musicke particularly, performing all over the world and leaving a legacy of many fine recordings. Her solo career has taken a unique path, working closely with Michael Fields, Anthony Rooley and other excellent accompanists to create recitals which are always exploratory, finding unknown masterpieces, presenting them with a real sense of theatre and a rich diversity of vocal colour. Evelyn has a passion for music-drama in its many forms, and has performed works ranging from Hildegard of Bingen’s Ordo Virtutum, through baroque opera, to pieces by Peter Maxwell-Davies and David Bedford. All this extended experience in performance is brought to bear in her teaching. She is Vocal Professor at the internationally acclaimed specialist early music establishment, the ‘Schola Cantorum’, in Basel, Switzerland, and also travels to many parts of the world to give workshops and teach on summer courses; in recent years she has taught in Holland, Florida, Germany, Finland, Latvia, England and Japan. Michael Fields (lute, guitar) was born in Hawaii, where the song of the surf and the rhythm of ukuleles made a lasting impression on him. He began his musical journey playing folk, rock and jazz in California and Australia, until a romantic interest in older music brought him to England in 1974 to study classical guitar and lute. His career as a performer, conductor, and teacher has since taken him back around the world several times. His video of the Vivaldi Lute Concerto is a big favourite on YouTube! Michael is the Musical Director of Sastamala Gregoriana Early Music Festival in Finland, regarded as the leading early music festival in that country. Since meeting as students, Michael has enjoyed a fruitful partnership exploring music from folk-song to their own compositions with soprano Evelyn Tubb. 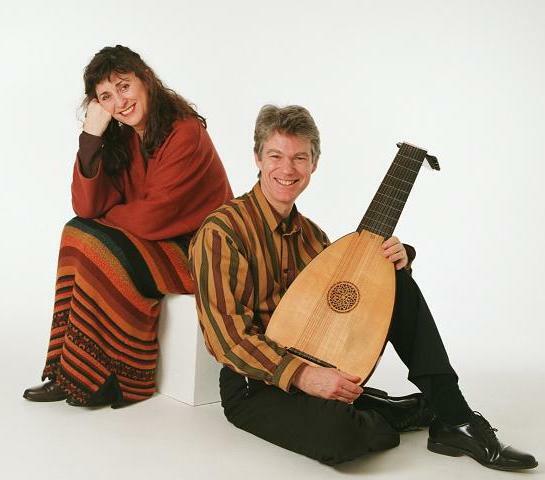 Their communication with each other, the music and the audience has found followers from Japan and Australia to Europe, with critics praising “the absolute affinity between voice and instrument” achieved by the duo. They have performed, recorded and taught courses together throughout the world. Hudební lahůdky, z. s. realizes its projects with financial support from the Ministry of Culture of the Czech Republic.